I ended up getting 22 packs of gum worth $28.38 for free which will go to the food bank since I rarely chew gum. Readers and I have now donated over $42,000 worth of food to local food banks. If you would like to participate, I’d love to have you join. Not only will you be able to help your local food bank, you will learn to save quite a bit of money on your own grocery shopping. 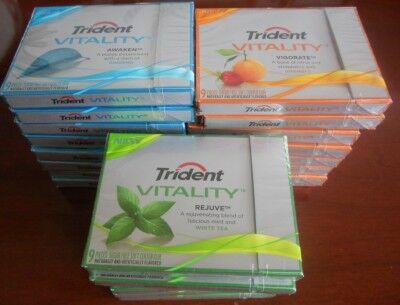 This entry was posted in Coupons, Penny Experiment and tagged free gum, free trident gum, Trident gum, Trident Vitality, Trident Vitality Awaken gum, Trident Vitality Rejuve gum, trident Vitality Vigorate gum. Bookmark the permalink. No go. You have to B1G1 free. Not free products coupon. But you did it anyway. The price of the gum is currently $1.29 a pack. 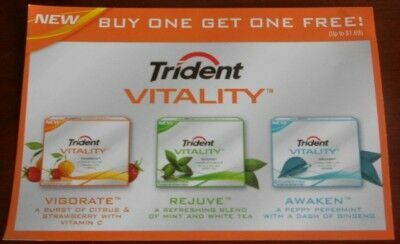 In a regular scenario, you would pay $1.29 and get $1.29 off when you buy two packs of gum, so esentially the coupon is worth $1.29. This week Safeway is offering a B1G1 free store discount. When you make the purchase, $1.29 is automatically taken off (the store discount) and then the manufacturer coupon is used to take $1.29 off. This makes the items free when you buy two. The receipt shows 5 packs of gum where purchased. Why not 6, since every other one is free? There were actually 10 packages purchased in that transaction. You can see on the top that 5 were discounted by the store and at the bottom 5 with manufacturer coupons. 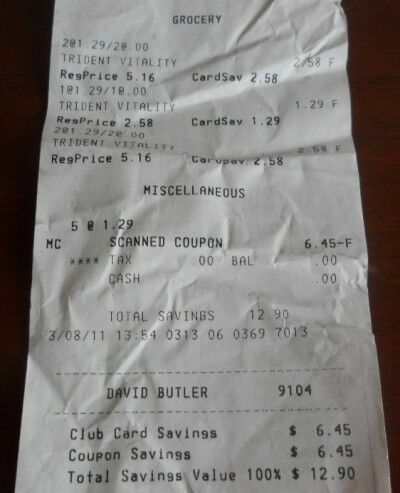 If the cashier said that to you, then they misunderstood the coupon. A “transaction” in coupon terms means “item” — basically you can’t use two coupons on the same item, but if you buy four in this case, you can use two coupons and get them all for free. Many cashiers make this mistake. I have this “one transaction per visit discussion” that extends to the manager coming down to the register and saying with great disgust, “Okay, just give it to her.” That is the response when I have a coupon for a free item. No other purchase or coupon necessary. I want to use it with their B1G1 by “buying” the item with the free coupon and getting the free one they advertise. The cashier and manager say that I am not paying for anything, just taking two products. I point out that I am “buying” with the free product coupon because the store will receive the purchase price and the store offered the G1. Do you ever have this problem? Each time, I am treated like a cheat. I realize this is an old post. Sorry. Yes, unfortunately I get this quite often. Sometimes the manager is knowledgeable and that solves the problem, sometimes not. I have found the best way to deal with this is to hav the coupon policy of the store with me (when available) or a letter from the store stating that it is OK to do this.